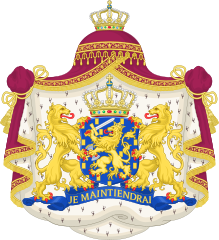 Prinsjesdag 2016 will take place on Tuesday September 20, in the Hague. I hope the weather is better than last year! yes! it is that time of the year again. i can't wait to see what maxima wears. she made me drool with her gorgeous dress last year by Jan Taminiau, inspired in the huis ten bosch palace. "First Orange fans are already along the route"
The last time the carriage was used was in 1923. The steps are narrow, the king and queen have practiced getting in and out of the carriage. They will use Frisian horses for the glass carriage and Groningen horses for the other carriages. The route is slightly different due to the construction of an underground parking garage. This means that the carriage will not pass the cabinet of the King, where Princess Beatrix usually looks from the window. She is now standing on the steps of the Mauritshuis. 1st carriage: the master of ceremonies of the court and the chaimberlain of the province of Flevoland. 2nd carriage: Grand Master and Grand Mistress. 3rd carriage (Gala glass Berliner): Prince Constantijn and Princess Laurentien. The princess is wearing a trash bag coloured outfit from head to toe. Knitted metallic jersey is the fabric, according to the NOS. 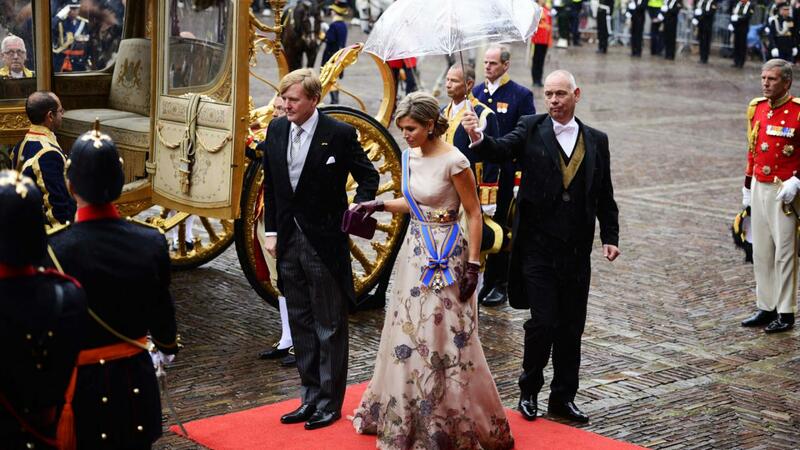 She is wearing Queen Máxima's chandelier earrings and an insect brooch. Edit: according to modekoninginmaxima.nl, the dress is made by Hardies (The Hague) and Talbot Rumhof. The inspiration was a coat of mail. The hat was made by Evelien Gentis of Eudia. 4th carriage (Glass carriage): the King and Queen. Queen Máxima is wearing a dress that has a night blue armure top and a golden silk & satin double garbardine skirt with blue guipire lace and small sequins. The dress has been made by Claes Iversen. 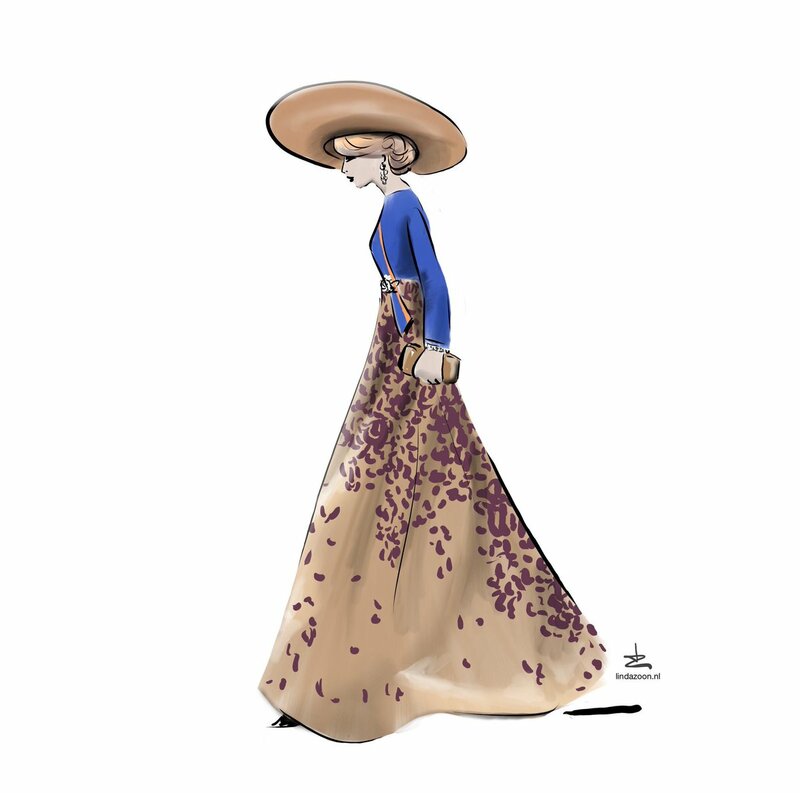 HM is also wearing a wide brimmed golden Parabuntal hat by Fabienne Delvigne. She is wearing Queen Beatrix' sapphire earrnings and a diamond-sapphire bow brooch of the dismantled Amsterdam parure. Does anyone know who is that with Geert Wilders ? That is his 2nd wife Krisztina Marfai. I believe she is from Hungary, which is ironic as he is usually ranting about Eastern Europeans in The Netherlands. The female politicians mostly look horrendous as usual. Marianne Thieme, leader of the 'Party of the Animals' is dressed as a circus director it seems. 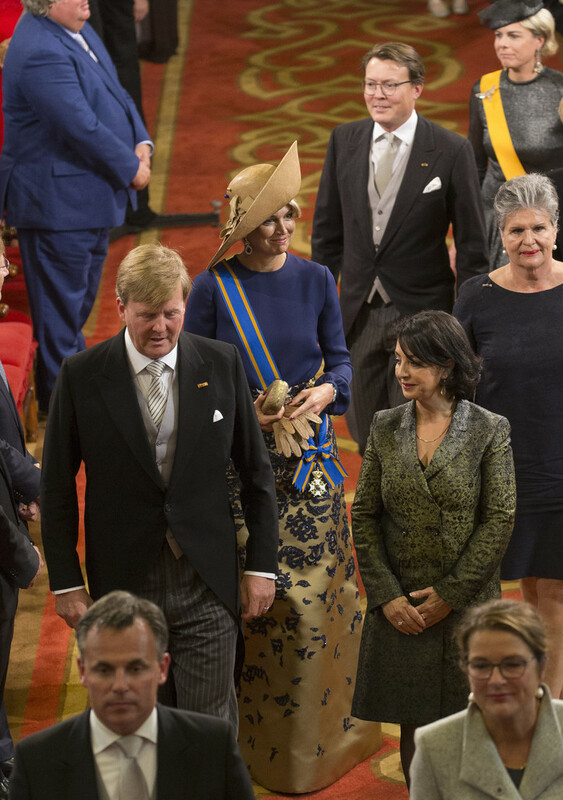 King Willem-Alexander and queen Máxima arrive at the Dutch Parliament. Some extra photos from PPE ,the glass coach looks magnificent! maxima looks magnificent. this dress doesn't top up last year's but comes a close second. i wouldn't be surprised if it was also jan taminiau - he sure knows how to dress the queen. 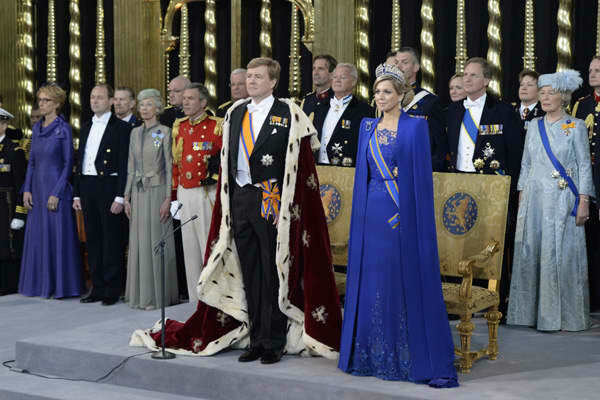 blue is also maxima's colour, she looks great in it (just like during her inauguration). A large renovation of the Inner Court will start in 2020. 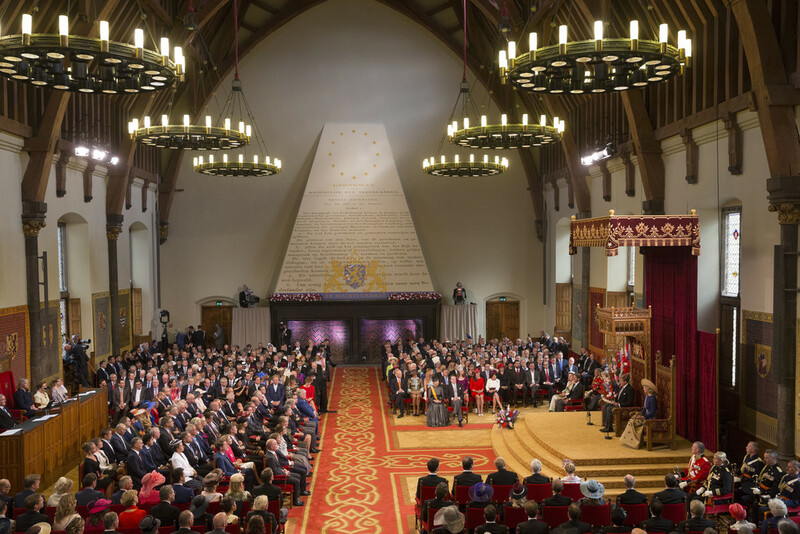 Minister Blok has said that parlament should decide what they want to do for the opening of parlement: re-open the Hall of Knights for a day or move to a different location. A re-opening will result in a delay of the renovation, a sad-looking Inner court as it is under re-construction and extra costs, a majority of the chamber is against this idea. A possibility is to move the opening to the Grote Kerk (Great Church) of The Hague. Much better than the Golden Carriage, I must say. I think is a blouse and skirt! beautiful! Once again my absolute favourite Dutch royal event has come round and as ever I have been impressed by the grandeur, the pomp and ceremony, the formality and the importance of the event - I always love to hear the King's fanfare and to see the carriages and balcony appearance and simply cannot fault the whole event!